Funny how these ISIS brides all suddenly want to go back to the countries the left. Doesn’t look like it’s part of a big ISIS plan to carry out attacks, use a young woman and child so it looks like they just want to be home safe with family. The American ISIS bride who wants to come home to the US has told how she wants the government to pay for her to undergo therapy if it allows her to return but she does not want to go to jail. Hoda Muthana, 24, spoke on Wednesday in an interview with ABC News, her first since fleeing the terror group three weeks ago, from a refugee camp in northern Syria. With her 18-month-old son balanced on her lap, she said she had given up the extremist ‘ideology’ that convinced her to leave her family and that she wanted to be welcomed home by the American people. And the U.S didn’t take a long time to respond! She won’t be allowed to return to the United States with her toddler son because she is not an American citizen, the U.S. said on Wednesday. Her lawyer is challenging that claim. 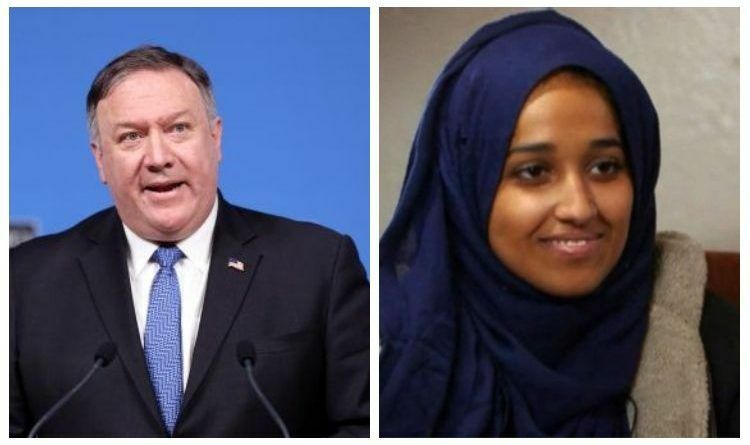 Secretary of State Mike Pompeo said Hoda Muthana, who is now in a refugee camp in Syria along with others who fled the remnants of the Islamic State, has no legal claim to citizenship and will not be permitted to enter the country. In a brief statement, Pompeo gave no details as to how the administration determined that Muthana, 24, is not a citizen. “She does not have any legal basis, no valid U.S. passport, no right to a passport nor any visa to travel to the United States,” he said. But her lawyer, Hassan Shibly, insisted she was born in the United States and had a valid passport before she joined the Islamic State in 2014. He says she has renounced the terrorist group and wants to come home to protect her son regardless of the legal consequences. I am sure her lawyer is some crazy liberal hungry for money but this is America and President Trump doesn’t want terrorist in his country!